Traditionally when people think of seeing cherry blossoms in Japan they think of late March to April, however perhaps not so well known is that it is possible to enjoy the blossoming of these beautiful trees from February in the countryside. 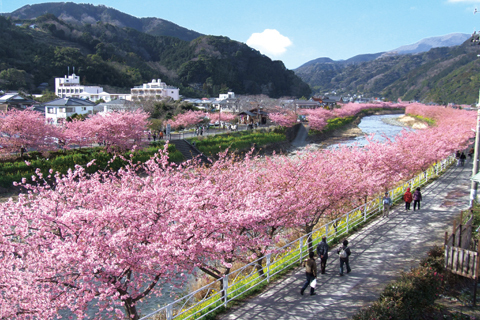 One of the most well-known places is in Kawazu, in Shizuoka prefecture where a cherry blossom festival takes place between early February and early March. 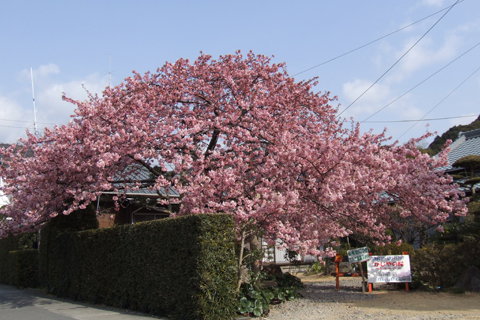 This specific tree, Kawazu-Zakura, is a hybrid of Oshima-Zakura and Kanhi-Zakura and has been the official flower of Kawazu since 1975. 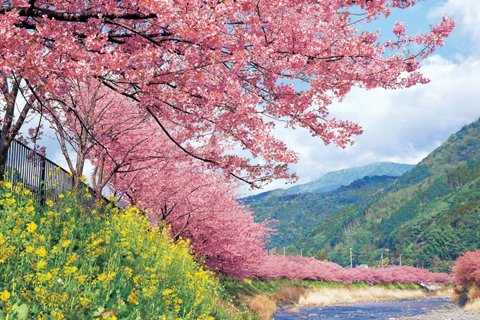 Characteristically it has large flowers with big petals and a dark pink colour, unbelievably there are over 8,000 trees the vast majority of which line the river which divides the town and leads to the sea. It might seem like the custom of viewing cherry blossoms is a recent one, in particular it is hard to imagine people hundreds of years ago making a special effort to go see them, and enjoy eating and drinking, however in fact it is believed that this custom started over 1300 years ago. 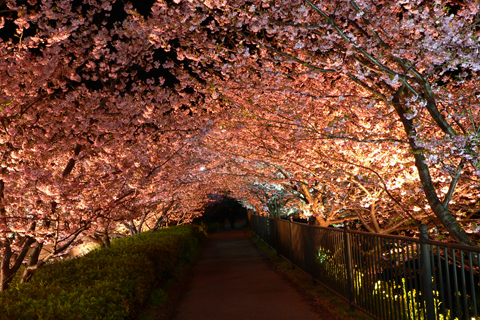 It is even mentioned in the world famous story The Tale of Genji, where the viewing of cherry blossoms was first described as Hanami (花見) . There are documented accounts of emperors hosting big Hanami parties with lots of food and drink, while by the Edo period it had become common for everyone to enjoy Hanami parties every spring. 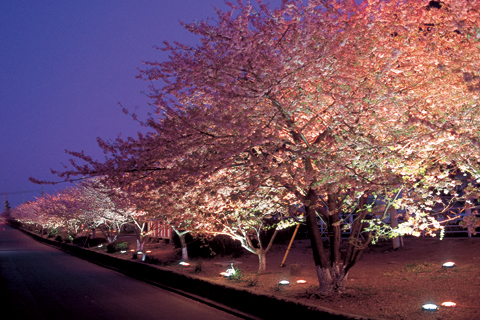 The time for viewing cherry blossoms is relatively short, normally around two weeks, and as it coincides with the start of school, and as new employees usually start at this time as well, Hanami parties are very popular for welcoming parties. 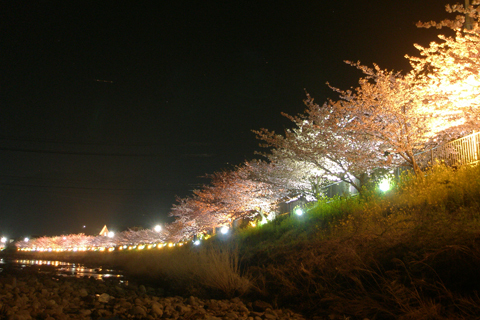 It has reached such a level of importance in people’s minds that now there is cherry blossom front prediction every year in order to give the local people of each region some idea of when the trees will start blossoming so that they can plan their Hanami. As can be imagined the first blossoms start in the south of the country and within the following two weeks trees in the centre and then in the north start to blossom. Often at a Hanami party people eat dango, amongst other food, and drink sake. 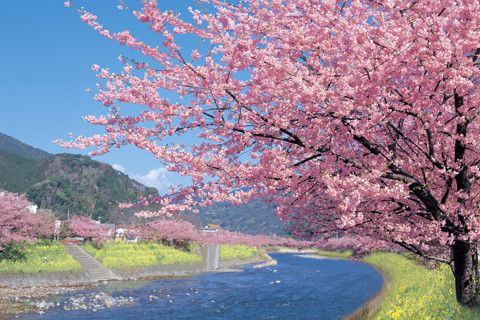 As such it is easy to see why the Kawazu Cherry Blossom Festival is so popular as it takes place well in advance of the normal Hanami season, and despite the cold normally one million people visit annually. As previously said the majority of the trees line the river along a route of about seven miles, all along this route you can find many stalls selling food and festival related items and in addition there are many other things to see. About fifteen minutes away from the train station you can see the original Kawazu-Zakura tree from which all of the other trees originated, it is over sixty years old and its height is an impressive ten meters. In the centre of town at the Kinomiya Shrine you can see a National Natural Treasure, a Camphor tree which is over a thousand years old. Towards the edge of town there is a big onsen facility, an onsen is a hot spring public bath which is another favourite custom for Japanese people, and just outside of town there is an amazing set of waterfalls called Kawazu Seven Waterfalls. Kawazu takes over two hours to get to from Tokyo and slightly less time from Shizuoka, this may seem like a long time, but it is without doubt worth it. Besides you will be able to surprise many friends or co-workers by telling them that you have seen the Cherry Blossoms already! Thank you to the Kawazu Tourist Association for the use of their photos, more information about the festival can be viewed here.